CGA: Although your project is graphic, you got your start as a photographer, is that right? Rob: Yes, I have been a photographer all of my life. I began by studying photography under Ansel Adams in Yosemite National Park when I was just nineteen years old. 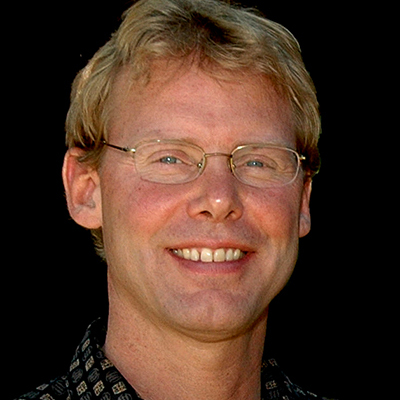 Although I have used my photographic skills since then, I mostly earned my living as a software developer, running my own business for the past thirty years. Now, I’m hoping to put all that in the rearview mirror and use my skills and experience to produce my own body of artwork — and hopefully make an impact, as well. CGA: Working with the famed Ansel Adams must have been a memorable experience. Do you think any of his influence is being reflected in this project? Rob: Yes, in two ways. First, I think studying under Ansel Adams forever cemented my love of photography, the national parks, and the national park experience. And second, I am now using digital high dynamic range (HDR) photography techniques to extend Adams’ Zone System, which I studied in Yosemite. CGA: How did you come up with the idea for creating this project? Rob: When my daughter was planning her wedding in Boulder, Colorado, she found a beautiful vintage dress, so we decided on a vintage theme for the event. For the save-the-date cards, table cards, and a full-size poster that the wedding guests would sign, I created WPA-style postcards with images of Boulder’s main attractions. 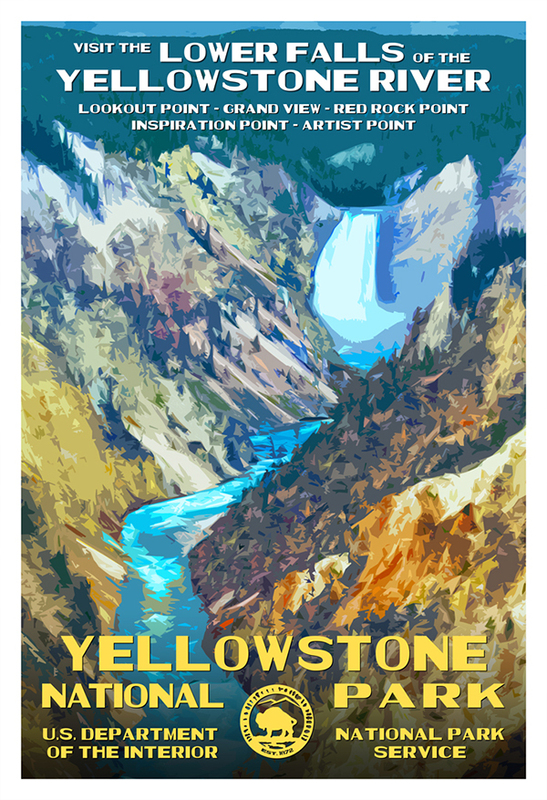 Everybody loved them, and that’s when I decided to create this series of national park posters. My passion for our national parks, photography, and the stylistic WPA designs from the 1930s and ‘40s all come together in this project. CGA: How do you work? Do you visit the parks first, take photos, and then decide which image best defines the essence of that particular park? Rob: I love that feeling of being awestruck as you first enter a national park. In the posters, I want to present an iconic image that reminds us of that specific park’s experience. Back in the digital darkroom, I sort through my shots and often try several different images before settling on the best one. CGA: How far along are you in the project? 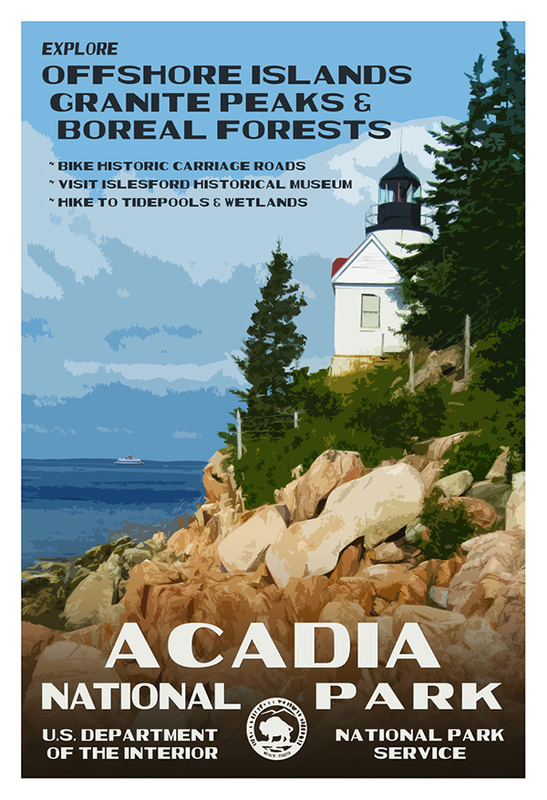 Rob: I have completed seven national park posters so far: Acadia, Arches, Glacier, two for Great Sand Dunes, Yellowstone, and Yosemite. There are six more currently in the works: Black Canyon of the Gunnison, Grand Teton, Haleakala, Mesa Verde, and two for Rocky Mountain. I have more original photos ready to create new posters after that. CGA: How are you funding the project? Rob: I’ve been self-funding the project for more than a year. But now, I’ve begun a Kickstarter campaign to raise enough money to print the first twelve posters in the series. The first six posters are currently selling well on both etsy.com and amazon.com. 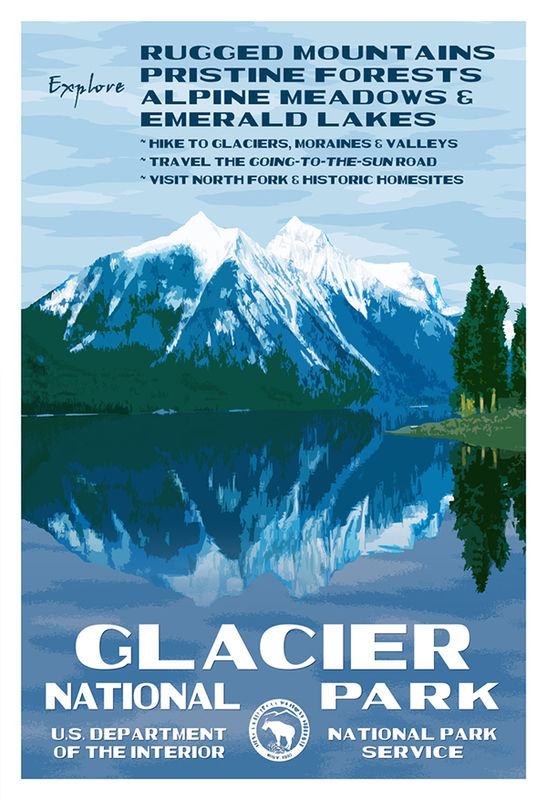 Ultimately, my intent is to get these posters into the bookstores at all of the national parks because they can use the proceeds to directly and positively impact park services and amenities. These posters — and eventually note cards and postcards — are popular items and can generate significant revenues for the park. Currently, I am donating 10 percent of sales to the National Park Conservation Association. CGA: What do you want people to get out of looking at or owning one of your posters? Rob: There are really three things I hope this project can accomplish. First, these posters are reminders of the great national park experiences most of us have had and shared. Second, if you haven’t yet visited a national park, I hope they will inspire you to get out and see these amazing places. And third, it seems like nearly every day, one of our parks is under siege from fire or flood or government shutdowns. 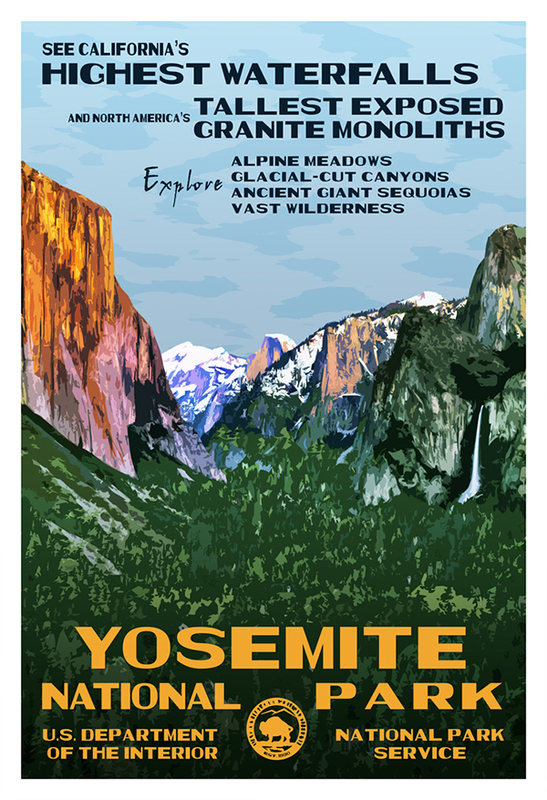 I hope the posters will remind people of why our national parks — with their astonishing landscapes, vibrant cultures, and rich history — are worth protecting today and for future generations. CGA: You talked about your daughter’s marriage having a connection to this national park poster project, and you also mentioned the threat to the parks by government shutdowns. Coincidentally, I also have a marriage connection to the national parks. My son had a wedding ceremony scheduled in Yosemite — which must be set up almost a year beforehand — and on the weekend it was to happen, the government shut the park down. Rob: Unfortunately, it all comes down to funding. Without it, every park suffers some sort of loss: fewer programs, closed campgrounds, limited facilities. There are both natural and human threats to our national parks; and without the funds to fight wildfires or handle the millions of American and international tourists, parks will have to raise fees and cut services. CGA: It’s a cliché, but our national parks really are quintessentially American. Europe, for example, essentially has no wild places left. Rob: Our national parks tell the story of America; and although this project revolves around creating iconic images for all fifty-nine national parks, it’s designed to remind us why they are so important and worth preserving. I encourage all of us to support our national parks in any way we can. We are putting together a series of national park posters for the pastor of our church. Two of the above posters are part of our selection. Are these for sale and how can I purchase them (Glacier and Yellowstone). Thanks for clearing that up. I appreciate the fact that you have done so. I love the project you are doing. It makes it even better when you are clear and concise when it comes to raising money and soliciting funds. The more clear and honest you are the more successful you will be. Thanks again! I think that this is a great project, but the photo that Rob used to create the Arches poster was not his original photo. It was taken by Neal Herbert from the NPS at the park. The artwork is a dirivitve of Neals photo, which is fine and legal because it is the public domain, but I do not think that Rob should claim he uses his own photographs. If he used someone’s photo on this poster, it makes me question the authenticity of the other posters. As a fellow photographer and graphic designer I praise hard work and creativity, but I also believe that credit should be given to those who it is due. Rob worked hard to create these posters, but Neal worked just as hard to have his photo taken without recognition. Just a thought. You are correct. The original photo in the Arches poster was taken by Neal Herbert. 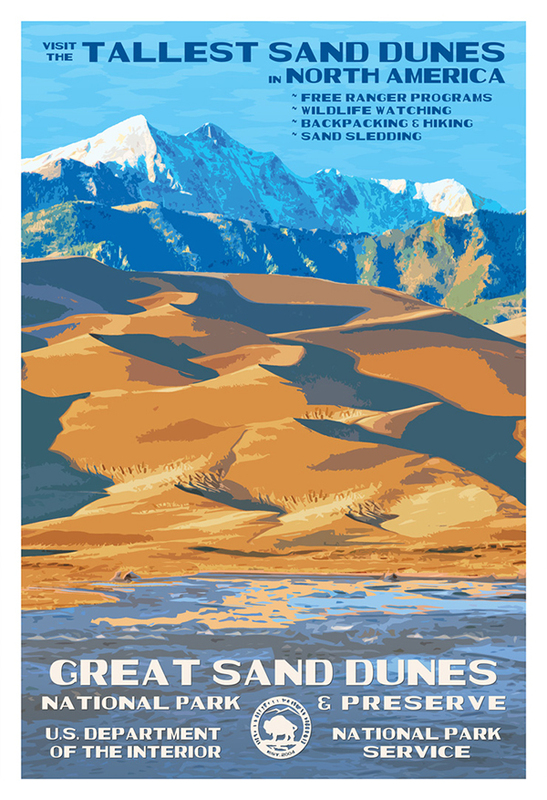 Likewise, the Great Sand Dunes poster was based on a photo taken by Park Ranger Patrick Myers. In 2013, Ranger Myers provided me with a high resolution photo to use as the basis of the Great Sand Dunes poster…and we had the exact same discussion about derivative works from a photo in the public domain. The result of that conversation was that it was OK and legal to use the image…and that no credit was required. However, on the National-Park-Posters.com site, I clearly give Mr. Myers credit for the photo. 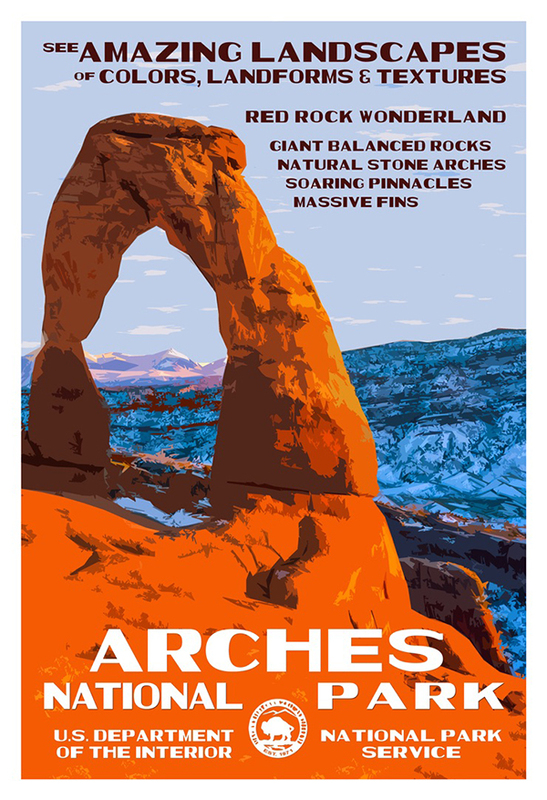 Now, I have updated the web site and done the same for Mr. Herbert and the Arches poster. Certainly, there was never any attempt to deny Mr. Herbert the credit he deserves, rather an omission on my part. I’ll try to be more clear about giving proper credit as the project moves forward, since to reach the project’s overall goal of creating 59 original posters, I will likely need to acquire photographs…and I want those photographers to have credit as well. Thank you for bringing this to my attention. I hope this clears up any confusion. What a fascinating project, thanks to you Candice, for doing that interesting interview with Rob Decker. I’ve always been inspired by Ansel Adams work as well. In spite of the digital age, a printed colorful poster has great value. Inspiring idea. As someone who lives in the UK, I’d like to refute that, we do have wild places. I do not know about ‘mainland’ Europe but the Scottish Highlands, the Lake District and many of the Islands that surround the UK are Wild and have a unique beauty of their own. Hi, Russell. My comment was based on research conducted by the Sierra Club. In one of the links in the article, you’ll find this reference, which reads: “Nobody is certain how much wilderness Europe has left, but the best estimates say it’s 1 percent or less.” Thanks for your comment! — C.G.A. Grand goal. All who visit national parks recognize the value of this challenge. I’ll share with artists I know. Brilliant idea, would be great to see the same sort of thing done for British national parks, to raise their profile/ create awareness. What a great idea, perhaps also some of these posters will then be for sale. These posters are so beautiful! I can’t wait to see the entire collection!